Recently, I have been trying to decide what exactly it is that I want to do as far as arts and crafts. I love makeup, but already tried AVON. I've sold men's ties, men's socks and costume jewelry before but fell flat. I love making people smile when I give them something from the heart and something I made. So why is it that I'm not completely satisfied? Not sure what my 'thing' is. So I guess I have a lot of discovering to do. Go with what you love to do and take it from there...you ROCK!!!! 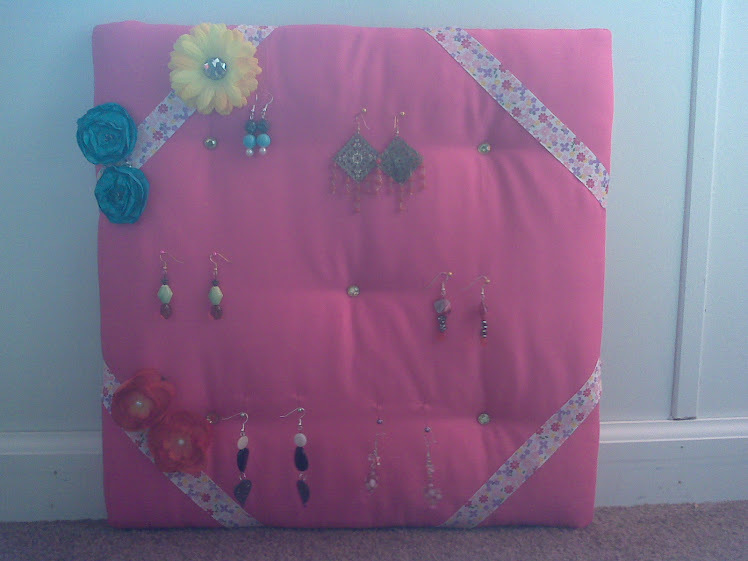 I would really like to continue the earring boards and make bracelets and stuff. Someone wrote on my wall and said my pillow cases are gorgeous..that makes me feel good. We'll see. I will continue with the cloth books and starting to sew crayon rolls so the little ones won't lose their crayons and can travel with them.